In our jobs it is not unusual for some activities to include several pay items, each with a different quantity, different unit price, different dollar amount. How do you account for this using Spider Project? In our billings we are required to show in a transparent way the quantity [volume of work], the unit of volume, the unit price, the extended dollar amount for budget, total to date and current period for every pay item. In the case of activities such as elevated slab forms it might have different pay items such as forms, electrical, mechanical, reinforcing steel, each with different quantity, different unit of work ... but multiple pay items and their corresponding activity must be modeled under the same activity as to keep the resources working as a team. I have not figured it out how to use Spider Project as a billing tool; no matter if using cost loading at the activity level, at the resource level or material resource. 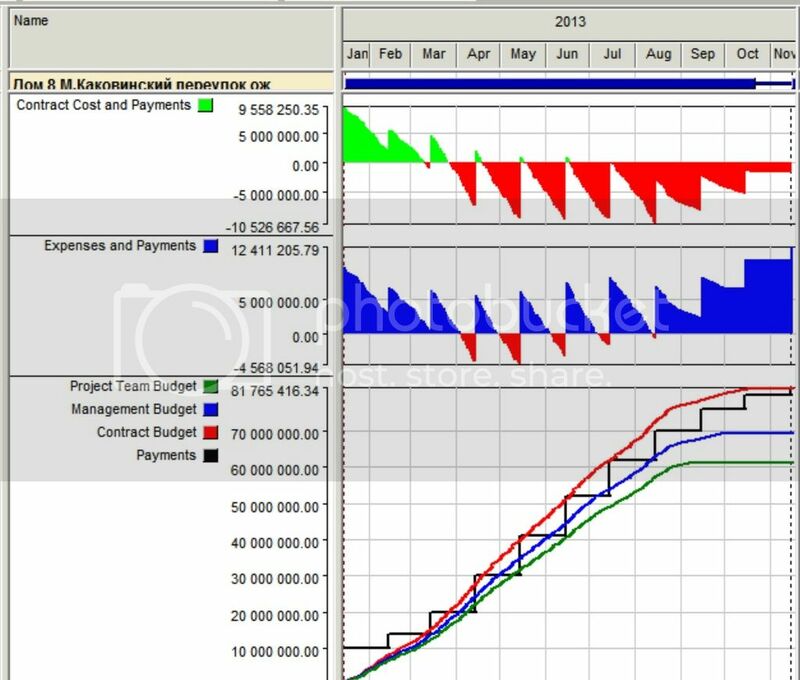 It looks like an easy task if using P6, similar to SureTrak which I have used once before as a billing tool. AGREE - It does not mean that all Spider users actually manage payments this way. I also prefer to use activity priorities but if certain order of activity execution is mandated preferntial logic can be used. Spider Project is developing basing on users needs and requirements. Russian forum of Spider Project users includes Proposals to developers track and we are serious about meeting our users requirements even if some functionality will be used by small number of planners. Payment schedule was one of users wishes, so it was developed and included. It does not mean that all Spider users actually manage payments this way. But an option exists and those who need have an opportunity. In any case we always warn our users that project status based on jobs really done and project status based on jobs approved and accepred are different. So one schedule is for resource management and another one for contractual relationships and payments. Second schedule does not reflect the real project status. Comparing these two schedules it is easy to learn what jobs were done but not paid, to get reports on Earned Value and Paid Value, Maybe too complicated but still useful. I prefer to use prioritization instead of so called "soft/preferential links" like some I believe it is not always a good idea on resource leveled schedule. I favor giving the scheduler some freedom to make his scheduling choices and decide how to fix it if need be. Some people might decide to go with soft links other do not. Even if you do avoid preferential logic at times there are no other options like an example you gave us some time ago; if a road from A to B in what direction you start? Why not from an intermediate point toward A and B at the same time? Scheduling is part art, part science. In our practice he who makes the schedule keeps the options as long as his plan is reasonable and within contract targets. If someone wants to intervene then they shall keep the schedule as well as the means and methods under their responsibility. I also find Spider approach to use CPM schedule as a payment tool too complicated. A complication not required here except in some government jobs. I was hoping for some magic, such as the ability/option to add cost performance items to already closed activities. If asked to do so I rather skip the job and look for better opportunities that do not require such an unnecessary burden, it is too complicated even in the presence of magic. If you add the always present contractual requirement to fix the distorted and overly delayed schedule frequent out-of-sequence events this will trigger it becomes more than too complicated. The experience we had at the Navy Hangar Job was enough even when they opted to accept progress override and not to require fixing out-of-sequence logic neither retained logic, progress override or magic fixes. Here everything that becomes part of the contract is interpreted as to be enforced, referenced guidelines can be dangerous when insist theirs is the BEST way. we also add that if an activity has easyly measured volume (cubic meters, tons, etc.) then the requirement of its granularity may be skipped. This two periods requirement is about activities of duratin types and shall not be followed strictly. We suggest to try to create the schedule where we do not need to rely on mythical percent complete, so most activities of duration type shall be short enough to avoid Murphy's law (90% of work takes 90% of time, remaining 10% takes another 90% of time). But if an activity uses different resources on its parts, or resources have different productivity on its parts, or unit costs change then an activity shall be splitted to several activities. In your xample earthwork can be easily measured but if the soil is different at the same area and resources have different productivity, or different technology shall be used then it should be not Earthwork at area A, but Earthwork at area A with soil of type 1, Earthwork at area A with soil of type 2, etc. Another potential reason for splitting is the requirement to do the job in certain order. Then it may be Earthwork at Area A (axes x and y), Earthwork at area A (axes y and z), etc. For some reason we may want the job done at axes x and y first and so we split the work and set soft links. When the job at area A axes x and y is done other works may start at the same area. You said - 5. Activity duration shall not exceed two periods of schedule performance analysis. In the following example if the updating period is a week how do you propose to split the activities? If the updating period is a month how do you propose to split the activities? What if the activity move and so the distribution and amount of performance periods? What about work days [calendar exceptions] that can vary per work period or per individual shifts? What if resource availability increase activity duration as things change when schedule is updated? it can interfere with resource leveling and yield unnecessary results by not keeping contiguous the parts. It might work on CPM models of the 50's before resource leveling was added but not in more modern models. We do not need more cookie cutter guidelines that people have a tendency to view as black and white when referenced in our contracts become a legal mandate. 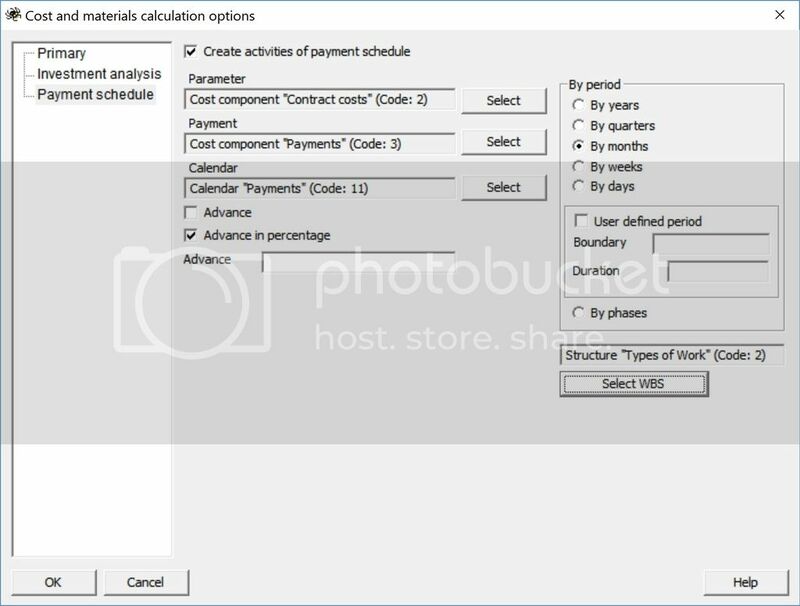 If payments are made for the work done with certain calendar (for example payments each month on the fifth day or later if it is non-working day for the work done in the previous month) Spider Project generates payment schedule automatically. You shall add cost component for payments with negative cost of the cost component unit. Once again this schedule and amounts are intended for the management purposes only. Real life is more complex and payments for some works may be delayed. 5. Activity duration shall not exceed two periods of schedule performance analysis. If unit cost, productivity, materials are different at activity parts create several activities instead of one. If these rules are followed then grouping activities by types (Activity Type WBS) we get the reports of volumes planned and done by types. This information is used for estimation of Earned Value but as I wrote previously it is used for comparison with the payment documents and not as the payment documents for many reasons: work could be done and still not approved, Contractors for some resons may want to be paid for some part of already done work, advance payments are usual, payments may require achiving certain milestones, etc. A lot depends on contract conditions. One activity may include different types of work in higher level schedules. Such schedules may be used for calculating Earned Value only if the payments are done for the finished activities. In this case activity contract cost shall be assigned to activity finish moment. In Spider Project it is possible to use workarounds and to set several volumes of work for the same activity but it will work only if their execution is proportional. In the real life people different types of work are done at different times and so such estimates are too rough to be used for estimating Earned Value. If I understood your example correctly you mean different materials associated with the activity work volume (fixtures). THEY ARE NOT COST COMPONENTS! It does not make sense to create different cost components for different resources/materials. Cost component is Material cost, each type of fixture has its unit cost (entered as Material cost component) and Spider will provide reports for each fixture in any case (amounts and costs). Fixture requirements may be set per work volume unit (as pieces, kg, ton or any other unit of measure, like x kg per 1 m2) for certain activity types. Usual cost components include Labor cost, Machine cost, Material cost, Indirect cost, Contract price, Penalties, etc. Expenses shall be grouped in the Cost center EXPENSES that may be compared with another Cost center CONTRACT COST that includes Contract price and Penalties. It depends on the contract type how the jobs are paid. It could be internal and contract costs for the same resources, etc. In any case we recommend Contractors to create at least two parallel budgets (Expenses and Contract) as different cost centers. Let me know if I did not understand your question.